The Trees Adventure High Ropes Park is an awesome setting for eco-adventure fun. Located in a stunning heritage garden of Belgrave, and next to Puffing Billy in Melbourne’s Dandenong Ranges, Trees Adventure is a must-see destination for all adventure lovers. With numerous adrenaline pumping obstacles high above the ground, you’ll be amazed and thrilled when you cross the thrilling tree-tops. The High Ropes Park has 12 mammoth flying foxes and up to sixty aerial challenges for adults and teenagers alike. 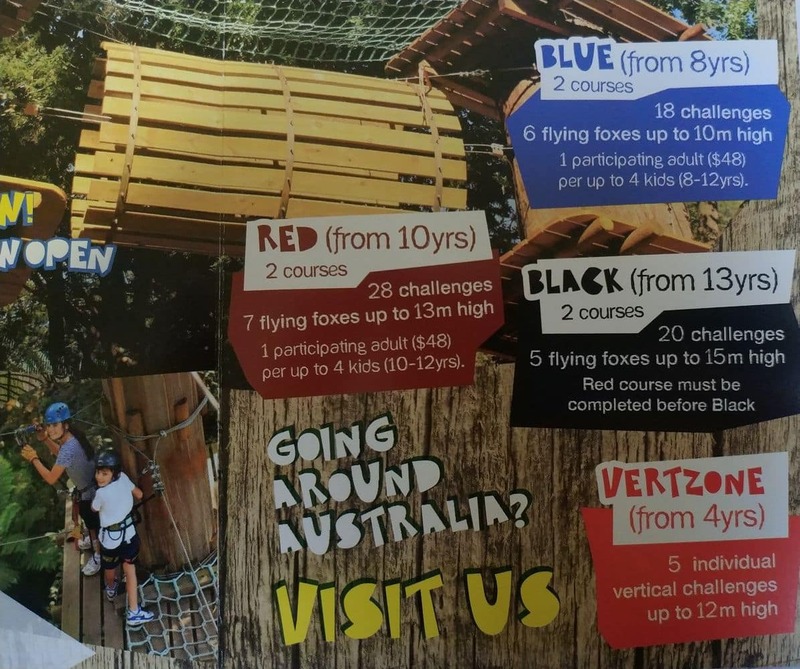 The rope courses have various levels; ranging from beginner to intermediate – it also has the black diamond extreme course featuring a 100 metre flying fox and a giant aerial skateboard. 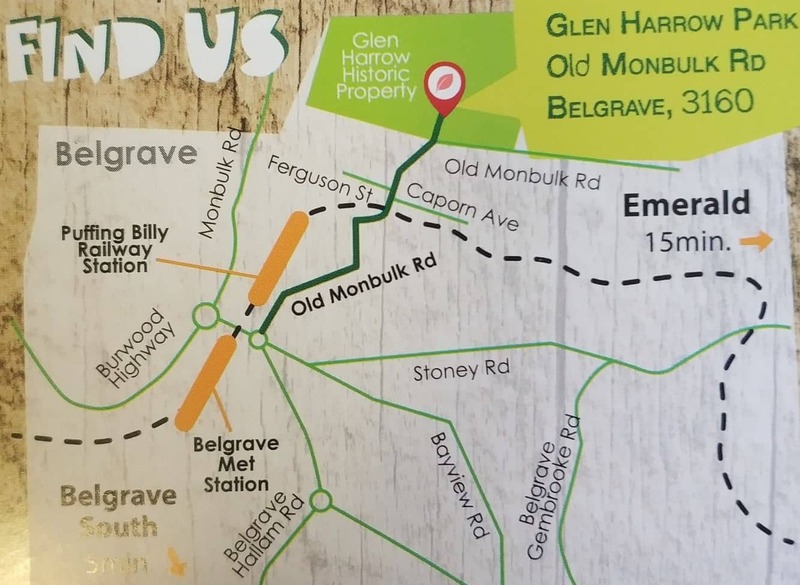 The venue also houses magnificent trees and rare plant species within its vicinity and is just a 5-minute walk from the Dandenong Ranges Belgrave train station. Though it’s a new eco-adventure, at Trees Adventure, you will certainly enjoy the exhilarating rides. 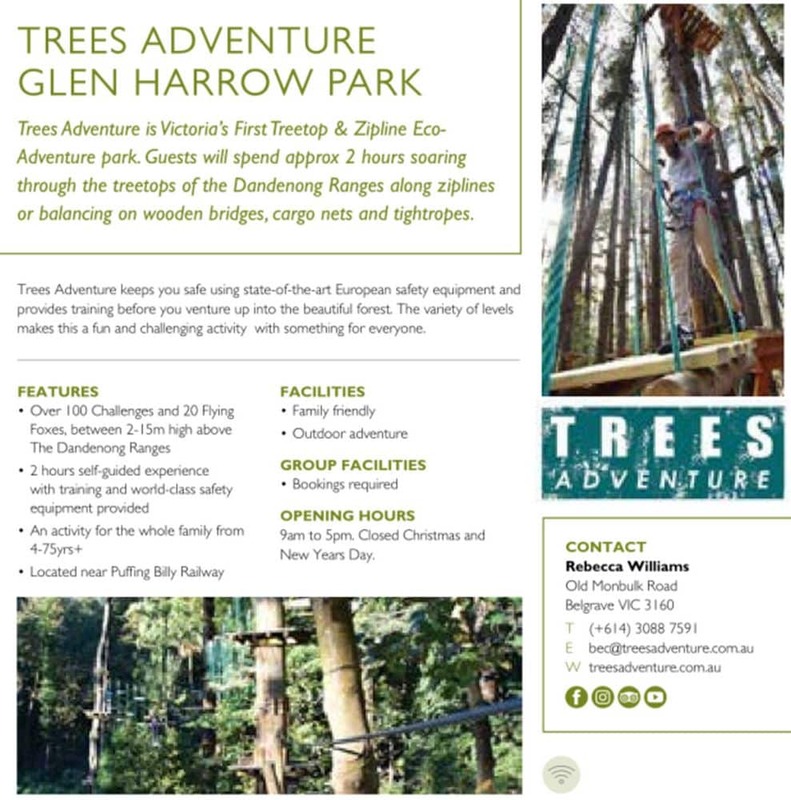 The popular courses have huge tree-top obstacles and flying fox courses, which you will pass through whilst crossing the Glen Harrow heritage gardens. Take up this thrilling challenge or just “hang out”. Your adventurous ride moves you between platforms of around 2 to 12 metres in height. Whilst crossing these, you’ll come across a series of imaginative obstacles. For those who are scared of heights can take the easy courses. However, before you start, you’ll be fully equipped and trained. Soar in a controlled and safe environment with various obstacles and thrills for you to experience and enjoy! Prices vary depending on your age, so check out the prices listed below. Yes, gift vouchers are available for Trees Adventure. Vouchers cover entry for a 2 hour session and will be emailed to you after payment. 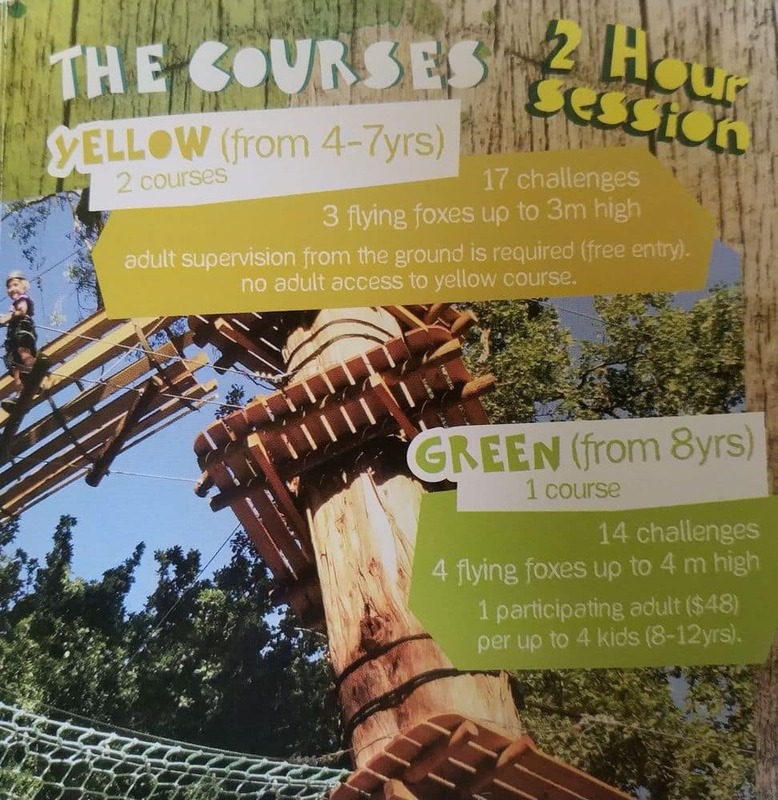 Gift vouchers can be redeemed at any of the Trees Adventure parks and include equipment, training and as many courses as they can fit in their session. The vouchers are valid for 12 months from the date of purchase and you can book a session to redeem the voucher online. You can purchase a voucher here. Select your location and then click the blue “buy a voucher button”. You will need to contact Trees Adventure here to make your booking. Yes, they will be open. Hi, I booked for 2 people this morning for 12/1/17 at 1300 and was told a confirmation and receipt would be sent to me via email, hasn’t arrived yet. I have tried to send you an email via your other page and get the reply an error has happened and can not be sent. We are not the operators of Trees Adventure and don’t take bookings on their behalf. To get a copy of your receipt, you will need to contact them here. I wish to visit the lavender farm and the sunflower farm and experience the Trees Adventure during the 3rd and 4th of Jan 2017. I would like to stay one night somewhere close or in the farm. I hope you have a great time in the Dandenong Ranges! 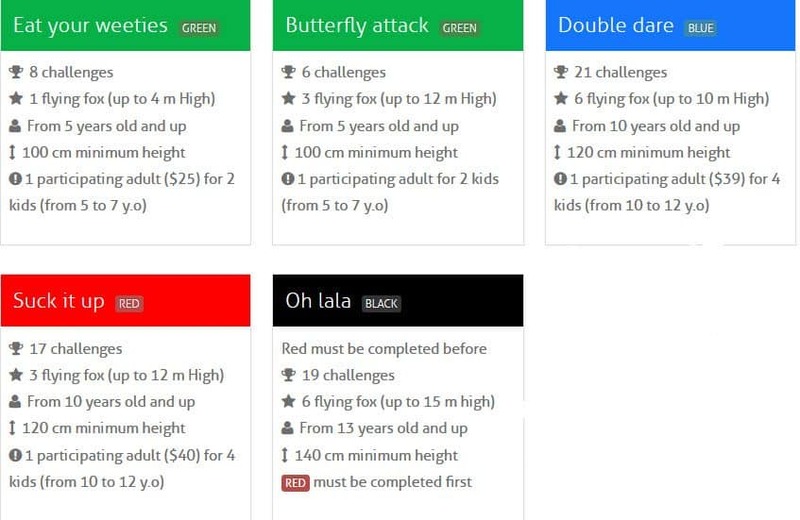 I was just wondering if it is possible to buy gift vouchers for the high ropes. If so how would I go about doing it? Hi Meredith, thanks for contacting us. Here is a link to the official website where you can purchase gift vouchers. Click the link on the left hand side which says “vouchers” which will take you to a form to be filled out and submitted to Trees Adventure. Enjoy your day at Trees Adventure! My husband and I took our 12 and 14 year old girls and we could have had a brilliant day apart from a couple of things. The course is really well designed and it has all the safety needs covered. The area is beautiful, very picturesque with great views. We were told how long each course takes but we found it took much longer, so you don’t get to do as much as you expect as your time runs out. This may be because it was school holidays, but there were too many people going through in one time slot, which holds everything up. Be careful to avoid going with a group of boys having a birthday party, as they are fearless and they want to push past you and some of them moved on to the aerial lines before I had finished getting off at the other end, making them sway more which was a bit frightening. There is one area when 2 different courses meet and my younger daughter got confused. When I asked Marcel to help her, he wasn’t very happy and his rudeness surprised me. I really think he is in the wrong job. Thanks for leaving feedback on your experience, I am sure the guys from Trees Adventure will see this quite soon as I appear just below them in Google. Having been there twice myself, you are right that there might need to be done regarding scheduling of people going onto the courses. I am at the other end of the scale as a 30yo man child monkey and fly through the course, so perhaps they can do more around either the gaps between people going onto the course, or perhaps start charging per individual course rather than as a 2 hour block. Additional to this, perhaps there could be a few landings every so often where it is possible to let people overtake (kind of like what happens in mini-golf where a family might let a couple play through). Having done similar rope courses up on the Gold Coast, I was also impressed with the quality and safety of all the gear and courses.